Students Call Their Study Tour to Italy "Amazing and Magnificent"
West Windsor, N.J. -- With students and faculty members alike suffering from gelato and Limoncello (more about that later) withdrawal, a group of intrepid travelers from MCCC's Study Tours program gathered for a final evening class on June 3. 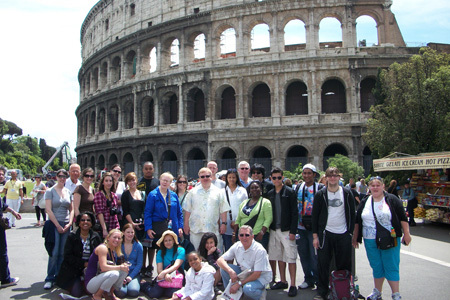 Students shared photos and reflections of their nine-day whirlwind tour of Italy May 19-28. Starting off the sessionm, students enjoyed a feast prepared by instructor Chris dePagnier. "We are dining on historic Roman dishes that date to medieval and ancient times," he said. The meal included wheat polenta with flaxseed, kale soup flavored with wine, and chicken cooked with almonds, pomegranate and saffron. "In ancient times, saffron was considered the 'gold' spice. If you ate it, you would have increased wealth," dePagnier noted. Almond and chocolate biscotti - and espresso, of course - completed the meal. Associate Professor of Business Andrea Lynch, who coordinated the trip, listened to students' presentations with fascination. "We all went into the trip with different perspectives and got different things out of it," she said. Of the 23 students who participated in Mercer's inaugural Study Tours experience, some were enrolled in Professor Marilyn Dietrich's "International Architecture and Culture" course, some came from dePagnier's "Food and Culture" course, and still others traveled as noncredit students. They also ranged in age, spanning three generations. 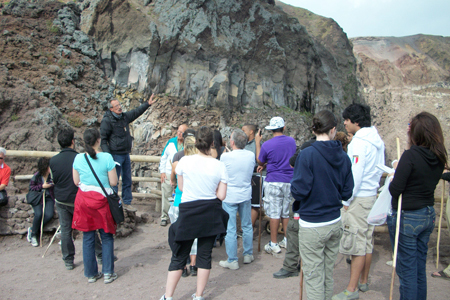 Students credited their tour guide, Massimo, with making the trip an incredible learning experience. Brian Rue and Lara Orner, both studying Hotel, Restaurant and Institution Management (HRIM), agreed that it exceeded expectations. "We learned so much. We could not have asked for a better experience," said Orner, who had never before left the East Coast of the United States. "Every nook and cranny of Rome hides something." Rue added that he had not expected to travel abroad as a Mercer student. "I had always wanted to go to Italy. This was a great opportunity. We squeezed every single minute out of the trip. When I go again - not if - I want to do it on my own." The lessons learned were both academic and social. Lynch was struck by students' enthusiasm and attentiveness as they made their way around the sites. "These students were in the moment," she said. "Education is all about engagement. That's where learning happens." They also formed close bonds. "They were from all different backgrounds and they became friends. The experience allowed them to connect naturally," she said. 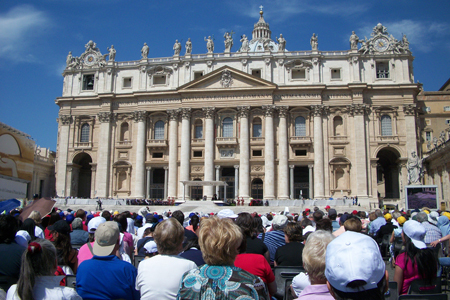 As they recounted their experiences, students spoke passionately about many special places - the Vatican, the Coliseum, St. Peter's Basilica, the ancient city of Pompeii, and the magnificent Amalfi coastline. A cheese-making demonstration and a tour of the Limoncello Distillery, which included samplings of the strong Italian liqueur made from lemon rinds, were also highlights. Just experiencing the culture was great, Dietrich said. Especially popular with students was the Italian custom of heading out in the evening to the many small cafes that line the streets. But Dietrich's students also soaked up the majestic and historic architecture that surrounded them everywhere. Architecture student James Reslier-Wells shared his photos that captured columns, arches, sconces, angles and intricate inlaid detail. "The symmetry and perfection in the structures were amazing," he noted. "Even the modern architecture reflects elements of the ancient." Reslier-Wells was particularly impressed by the scale of the Coliseum. "It's massive, unbelievable, magnificent." Kristie Cepparo, also studying architecture, was struck by the Coliseum's innovative design elements. "You could see the layers in the concrete blocks, the seating, all of it so ahead of its time and similar to the way things are built today," she said. South African student Maghia Neuman spoke of her fascination with Italian history. "History is what makes us understand each other," she observed. She also recalled the grandeur of the Amalfi Coast. "I thought I had seen mountains in my country, but I had never seen anything like this." She was intrigued by the elevator installed in the mountains that takes visitors from the shoreline to the top. "There was even a cemetery at the top for those buried there to enjoy the view. That was very touching to me," Neuman said. Pompeii was Lara Orner's favorite stop. "It's a place preserved in time," she said. Following Pompeii, the group stopped at Mt. Vesuvius. "We toured the entire city of Pompeii and then decided to hike up a volcano," she said with amusement. Seasoned traveler Leon Nolting, a retiree, signed up for the trip as a noncredit student because he wanted the input of professors and guides. "I want to absorb history, culture, economics, the whole thing," he said. He was particularly interested to discover that archeological excavation is still actively going on in Rome and Pompeii. He noted with satisfaction that he had no trouble keeping up with his younger traveling companions. Orner, who completed her HRIM degree at Mercer this semester, missed MCCC's commencement ceremonies while on the trip. But she has an even bigger regret, echoed by numerous classmates. "I wish we'd had more time," she said. 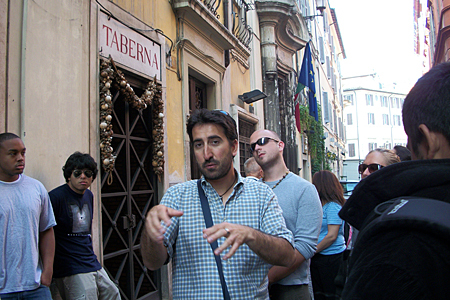 Everybody's favorite tour guide, Massimo. 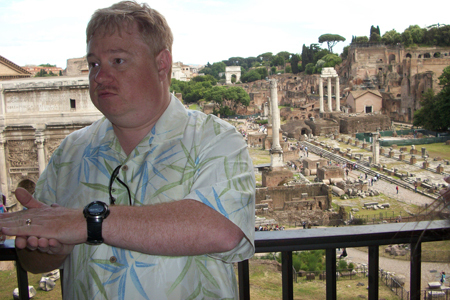 A teaching moment with faculty member Chris dePagnier at the Roman Forum. 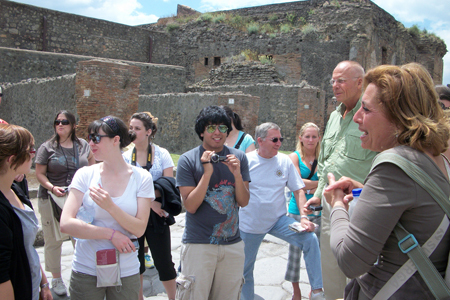 Italian guide, right, talks with students at Pompeii. 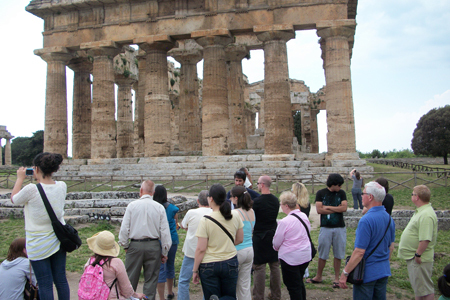 Group stops at ruins of Greek Temple. Waiting for the Pope at the Vatican.